Tiramisu is my favorite dessert to order in an Italian restaurant. 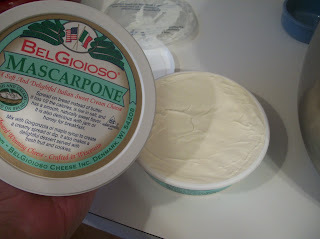 It's also the first thing I buy at our community's "Feast" in Little Italy every year. I've been mustering up the courage to make my own, and started last summer with the frozen version. (Also, I kept forgetting to buy mascarpone cheese!) After I made this, I heard that it was even better than the local Italian bakery's version! What a compliment! This dessert will dirty several bowls and takes some steps but it is worth it! You also need to refrigerate it overnight so that it sets up properly, so plan ahead! 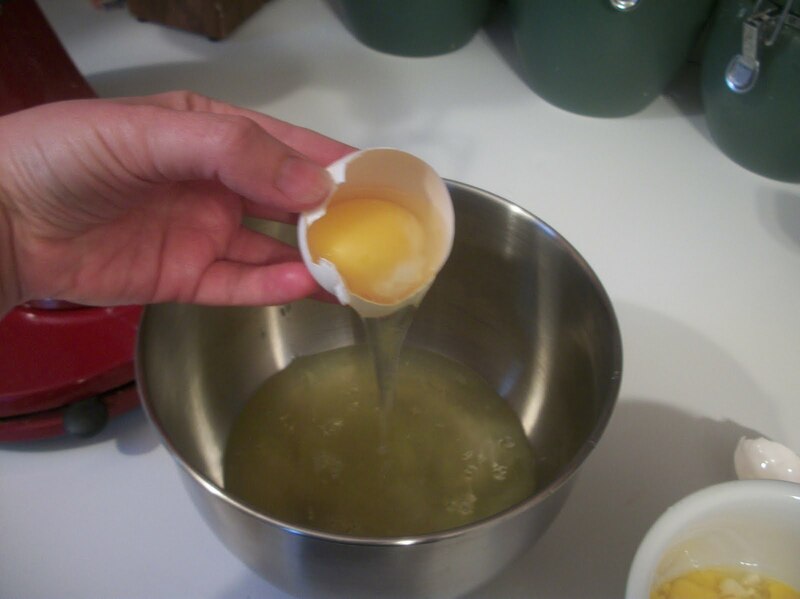 Start by separating the eggs. Some people have that cool egg separator doo-hicky but I just do it the old fashioned way in the shells. 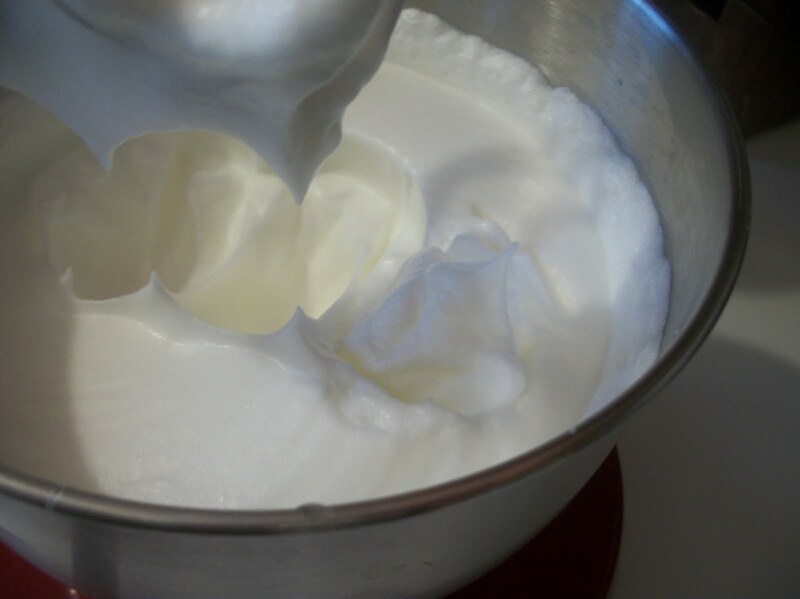 In a clean mixing bowl, with clean beaters, beat the egg whites until stiff peaks form. This means when you lift the beaters up, a little point will form and it won't fall. It will be sort of "stiff." This will take several minutes. and beat on low until well combined and smooth. 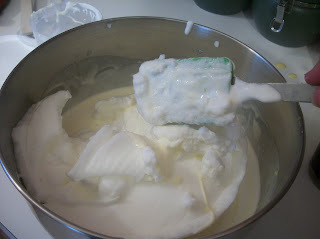 Then use a rubber scraper to gently fold in the egg whites and whipped cream. and stir gently just to combine. Set this aside. Dissolve the remaining sugar into the coffee. Pour the coffee into a 9-inch pan or some other shallow dish and have a 9x13 pan/dish ready. then place dipped side down in the 9x13 dish. 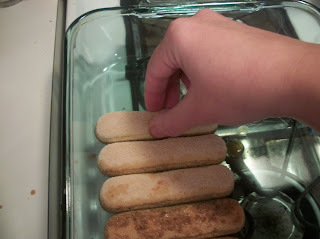 Note: DO NOT let the Ladyfingers sit in the coffee (like above)! That was for the picture, but it was too long! 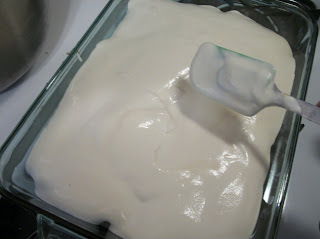 Just dip the side in and then transfer it to the pan. 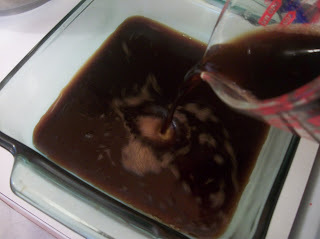 If you let them soak you will a) run out of coffee and b) have a very drippy (but still delicious!) 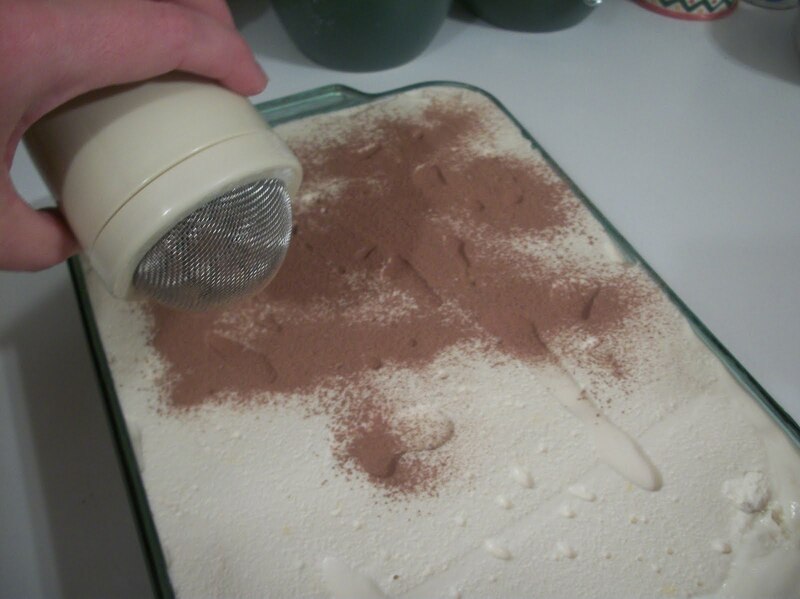 tiramisu. Pour half of the filling over the ladyfingers, spreading gently to cover. 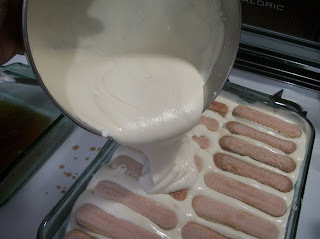 Repeat the process with the remaining ladyfingers, placing them dipped side down over the custard. 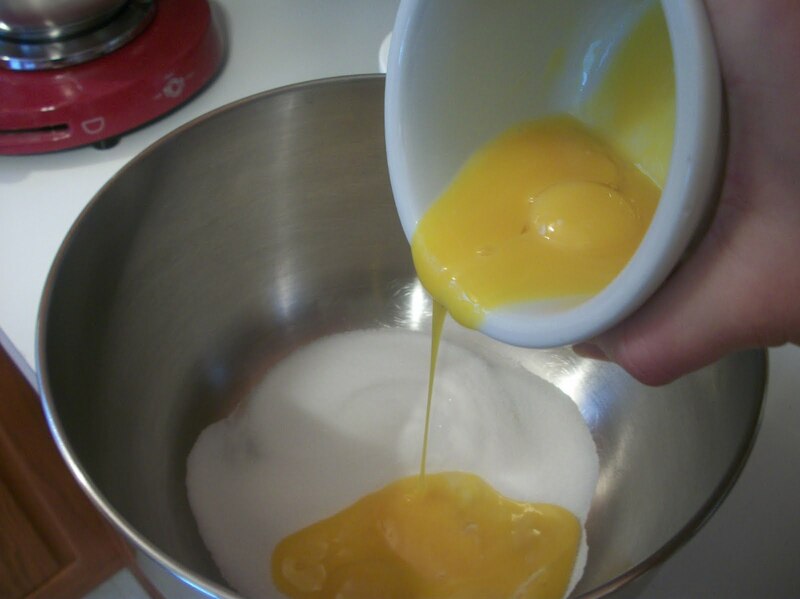 Top with the remaining custard. Refrigerate overnight. Just before you serve the dessert, sprinkle with cocoa. Find more recipes at Full Plate Thursday, Recipe Swap Thursday, Cooking Thursday, Sweets this Week, Foodie Friday, Food on Fridays, Friday Food, Sweet Tooth Friday, Friday Potluck, Fun with Food Friday and Sweets for a Saturday. In a medium bowl beat together the egg yolks and 1/3 cup of sugar. 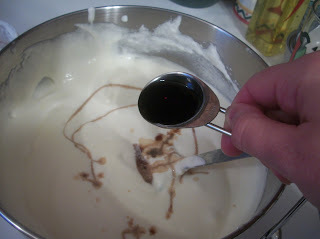 Gently mix in mascarpone cheese (on low speed), then use a rubber spatula to fold in beaten egg whites, whipped cream and kahlua; stir until smooth. Set aside. 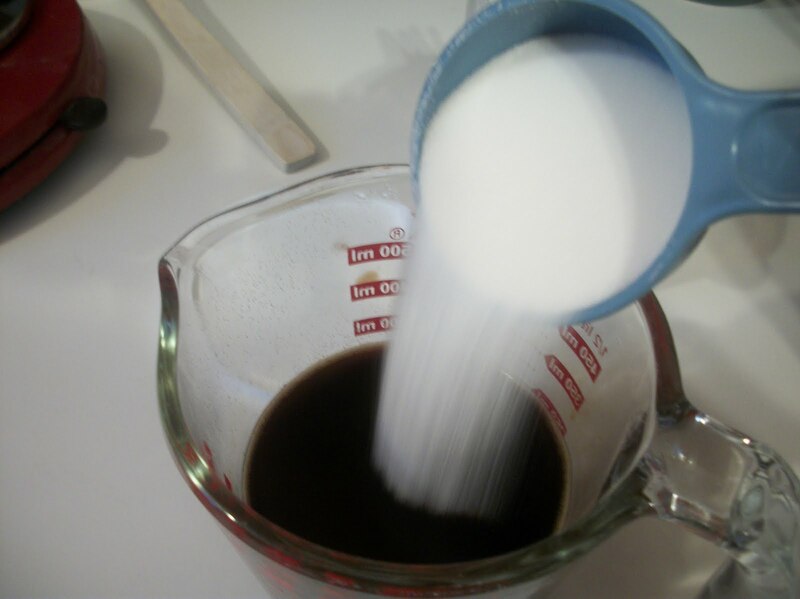 Dissolve remaining 2/3 cup sugar in coffee. 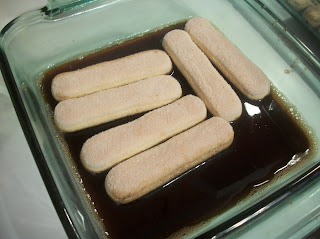 Quickly, to avoid complete saturation, dip one side of ladyfingers in coffee mixture. 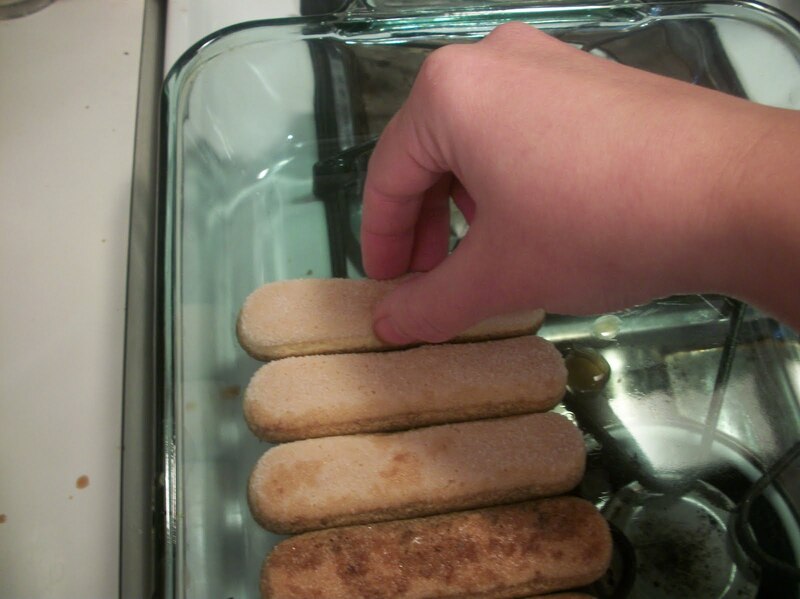 Place ladyfingers dipped side down in a single layer in a 9 x 13 inch glass baking dish. Spread half of the cheese mixture over the ladyfingers; repeat layers, ending with cheese mixture. Cover and refrigerate overnight. Sprinkle with cocoa just before serving. Serves 20. Looks delicious! Thank you for posting your family recipe! oh SO yum! This has been on my "To-Make" list for a while also. You've made it look so do-able. It looks GREAT! Thanks for adding this to Sweets This Week. 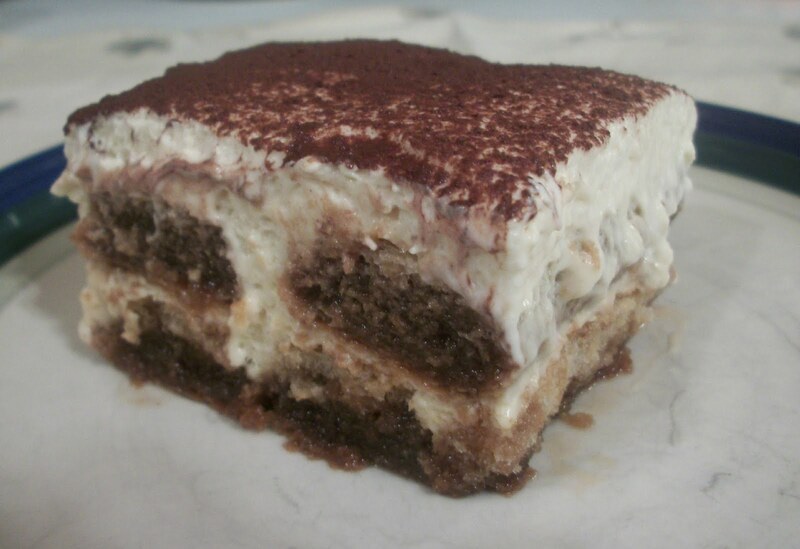 Tiramisu is one of my favorites. Your recipe looks very good and makes me want a nice slice of that right now. Thank you so much for sharing with Full Plate Thursday and please come back! 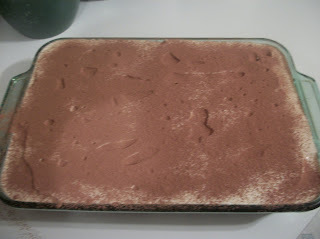 One of my favorite desserts to make... everyone LOVES it and thinks it took HOURS to make! You made it look DEVINE! This is one of my husbands favorite desserts! Thanks for stopping by and linking up with Sweet Tooth Friday. Yum! Thanks so much for sharing on Momtrends. I have lived in Italy for some time and miss tiramisu now that I am back in the States. This recipe is really close to how we made it while we were there. So nostalgic.